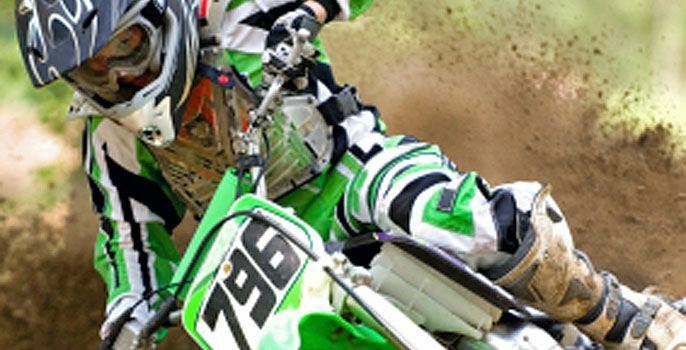 Directory of of Motocross Race Tracks Located in Tennessee. Also listed are Dirt Bike Trails, MX Parks, Enduro Trails, Supercross Tracks, Off Road Motorcyle and ATV Riding Areas. Fast Farms Motocross Track is located on the Cumberland Plateau near Manchester, Tenneessee. The layout is outdoor motocross, and lap times are around 2 minutes. Motocross and ATV are welcome. Overnight camping is permitted, hook-ups are available. PowerLine SX is a lighted Supercross style MX race track located in Atwood, Tennessee. See track website for race schedule. Muddy Creek Motocross Raceway, located near Blountville, Tennessee is the home of the Thor United States Mega Series, Kawasaki Team Green Tennessee State MX Championship, Suzuki Top Gun Showdown and the ATVA ITP/MOOSE ATV Summer Nationals. Christiana Motocross Track is located just 15 minutes from Murfreesboro, Tenneessee. The layout is outdoor motocross, and lap times are around 1:30. Motocross bikes and ATV are welcome. Overnight camping is available, no hook-ups. The Meadow Creek MX track is a 1.25 mile old style motocross track. Carefully constructed into the natural terrain of the Cumberland Plateau, it offers something for all types of riders. Reminiscent of an outdoor national track, Meadow Creek has uphill and downhill grades, wooded sections, whoops, sweeping and burmed curves, a double and tabletops. Meadow Creek was constructed with all riders in mind, so it has something to offer riders of all levels. Meadow Creek has a 20 bike concrete starting gate and a 40 bike natural starting gate for larger races. Meadow Creek MX track facilities include space for camping and parking. No hook-ups are available. Bathroom facilities with handicap access. I-81 MotorSports Park is a 400 acre Off-Road facility located at Exit #44 off I-81 between Greeneville & Kingsport, Tennesee I-81 MotorSports Park features a lighted Motocross Track, 1/4-Mile Short Track, 3/8-Mile Dirt Track, Beginner Practice Track, 8-Mile Hare Scrambles Course and miles and miles of trails. Amenities include permanent restrooms with showers and camping is permitted. Conveniently located in Middle Tennessee, Thunder Valley Motocross is about halfway between Nashville and Knoxville Tennessee, off I-40. Check track website for race schedule. Little Valley MX is a private motocross club that currently features a 1 mile natural terrain motocross track. Upcoming additions include a pee wee track for younger riders and a 1 way woods loop. Tumbling Creek Motocross is an outdoor mx track that features numerous elevation changes, sand whoops, and a sand mixed with dirt surface. Average lap times at Tumbling Creek Motocross are about 1:20. MxWildFlower Motor Sports Park features multiple Motocross tracks including an advanced MX track and a ATV/Quad track. For the younger riders there is a kids track and a pit bike track. Park is open 7 days a week. Submit a Tennessee Motocross Track! To have your Motocross Track listed or to update our information please Contact Us.